Dave Splash Dot Com: Fringe Has Entered the Upper Echelon of Science Fiction -- Watch This Show! Fringe Has Entered the Upper Echelon of Science Fiction -- Watch This Show! With the return of all my favorite shows, I anticipated that it would be Dexter that got the most attention from me. It may end up being that way (new season starts Sunday), but as of right now, Fox's Fringe may end up getting the nod. The third season of Fringe began last night with one helluva premiere episode. At first, I didn't care much for this science fiction thriller. The first season was questionable in my book. It had some decent episodes, and obviously some compelling characters, but it just seemed too "out there" for me. But since J.J. Abrams (Lost) was involved, I decided to stick with it for a while to see where it went. I think my main problem, initially, was Joshua Jackson (Peter Bishop). Jackson just seemed wrong for the show, and he kind of rubbed me the wrong way. His character seemed arrogant and aloof, and I didn't see why he was necessary to the show. He seemed little more than an angry babysitter for his father who was just sprung from a mental hospital. As Fringe proceeded through the season, I began to see why he was necessary. In season two, the larger story arc began to coalesce, and the relevance of the Bishops (Peter and his father, Walter) became obvious. 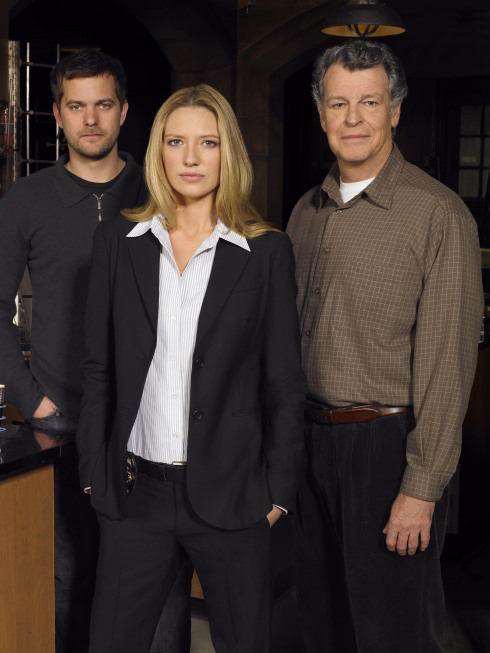 Over the course of the season, we learned that as a child, Agent Olivia Dunham (played by Anna Torv) was a subject in the controversial experiments conducted by Walter and his former partner, Dr. William Bell (played by the legendary Leonard Nimoy). She had little to no recollection of being a subject, but slowly began to recall her time in the lab in Jacksonville, FL where the experiments were conducted. Basically, Drs. Bishop and Bell learned of an alternate universe that was similar to ours in many ways. They began experimenting with a drug that would tie the two universes together, and allow for transport between the two. The drug gave the children certain special "abilities" to help them deal with the new universe, but the kids never learned how to properly control them before the experiments ended. Simultaneously, Walter's young son, Peter, was dying of a rare disease. The Peter from the other universe was still alive. Walter then devised a plan to visit the other side, and try to prevent that Peter from succumbing to the same disease. Instead, he simply takes Peter to his world, and essentially passes him off as his own. Later on, when a child dies during one of Walter and William's experiments, Walter is blamed and sent to the asylum where he spends the next two decades. William Bell, on the other hand, utilizes technology from the other universe to create a very profitable company and become a very rich and powerful person. He then begins to cross back and forth between universes so often, that he eventually becomes stuck on the other side. In the other universe, Walter Bishop is the Defense Secretary and is hell bent on getting to the other side to both retrieve his son, and to enact revenge. What our Walter did not realize at the time, was that when he crossed over and stole Peter, he inadvertently created an anomaly that wreaked havoc on the alternate universe, and made whole sections of the country uninhabitable. A special law enforcement division was created to deal with these anomalies -- the Fringe division. This division is led by Olivia and her partner Charlie (who died in our universe earlier in the season). Back in our world, Peter realizes that he is from the other side, and not really this Walter's son. In anger, he leaves Boston (where the show is based) and says he never wants to hear from Walter or Olivia again. This only lasts a short time, though, as eventually folks from the alternate universe find a way to cross over. Peter, still reeling in anger from feeling betrayed, agrees to go to the other side and help his "real" father. To make a long and complicated story short, Olivia and crew realize that the other Walter (aka Walternate) is just using Peter to help him destroy our universe. They cross over with the help of some of the other children experimented on (like Olivia) with the intent of rescuing Peter and saving the universe from destruction. While over there, they rescue Peter, and encounter their alternate universe doppelgangers (and we learn that Ana Torv is much more attractive as a blond than a redhead). Anticipating something like this, Walternate formulates a plan to switch the Olivias and have alt-Olivia travel back to our universe while keeping regular Olivia in the alternate universe. At the end of last season, we saw the crew escape with the alt-Olivia in tow. Season Three's opener takes place almost entirely in the alternate universe. In it, we see Olivia locked away in what looks like a mental hospital. She is poked and prodded and riddled with questions by the doctors. She is also injected with an experimental drug that is designed to implant alt-Olivia's memories into her, making her a combination of the two. The idea is to have Olivia reveal what she knows about crossing between worlds, and use it to aid in the eventual attack on our universe. For much of the episode, the treatments do not seem to work. Olivia tells her doctors that she is not who they think she is. At one point, she takes advantage of an opportunity to escape from the hospital and flee. She kidnaps a cab driver (played by Andre Royo aka "Bubbles" from The Wire) at gunpoint and forces him to take her to Massive Dynamic (the company formed by William Bell). However, in this universe, there is no such place. Over the course of the cab trip, Olivia begins becoming confused about her identity, and even notices a tattoo on her neck (which alt-Olivia has, but not her). As the fringe division begins closing in on her, she is becoming increasingly confused. She then has the cabbie take her to a "safe house" she knows of. Turns out, however, that the safe house is actually her Mother's house (yet our Olivia's mother died when Olivia was only 14). After seeing her Mother and having no idea how she knew the address of a person she thought died decades earlier, the merging of the two Olivia's becomes complete. When alternate universe Charlie appears at the safe house, Olivia willingly leaves with him to rejoin her fringe team. Her partner has no idea that she is really from the other side, and increasingly, neither does she. The episode closes back on our world as Peter testifies to the FBI about what had occurred and then attempts to re-ignite the romance between him and Olivia. The alt-Olivia (now blond) plays along. Fringe has masterfully crafted an amazing premise for the new season. I can only imagine that slowly Peter and Walter will realize Olivia is not who she claims to be, and seek to return to the other side to get the real Olivia. The twist, however, is whether or not Olivia will know who they are and even know who she is. And what about alt-Olivia? Will she want to go back after seeing what life is like on our side? What exactly is her plan? Whether or not Fringe ever overtakes Dexter as my favorite one hour drama remains to be seen. Either way, though, it has become must-see TV for me, and is rapidly becoming one of the best science fiction shows of all time. They have really stepped up their game this year.